If one were to believe the news cycle, the current crisis in Somalia would seem to have arisen without warning. But it is part of a pattern we have had plenty of opportunity to observe and recognise. In fact Eastern Africa is historically well acquainted with famine. Many regard the 'Responsibility to Protect' as a doctrine which licences military intervention when civilians' lives are threatened by murderous governments. 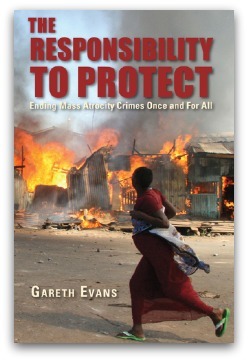 In fact, R2P emphasises the 'responsibility to prevent' as much as it does the responsibility to intervene. Political and social ideas are a means of conceptualising people's inner urgings and desires. Does the movement towards political change in the Middle East constitute an 'absolute moment' which forecasts the realisation of democratic governments across the Arab world? Soon enough there was a group of children in the yard and a soccer game was about to begin. First we had to decide the teams. I asked one small boy, whose family was from Sri Lanka, which country he wanted his team to be. 'Australia,' he yelled back. America has grown so used to triumphing in the conflicts of the 1990s that mere stasis is now easily viewed as retreat. But from Teddy Roosevelt to Barack Obama, each time America has become blind to the limitations of its power, it has been wrenched back to reality by failure. Flicking the frisbee with a well practised arm, Jimmy told me about his former home in Sri Lanka. 'Last time I was there, I was carrying bodies to their graves in my arms, even the bodies of friends.' Homer's Iliad is a poem of force in which, at all times, the human spirit is shown modified by its relations with force. The fact that we are 'discussing' more than ever before due to the internet and the blogosphere, does not prove that our democracy is in better shape. The environment precludes reasoning because reasoning requires a willingness to listen to the other and to approach questions through mutual respect. The latest G8 meeting sparked new protests at the failure of rich countries to honour their promises to increase aid. The protest pointed not only to the failures of the G8 governments, but also to the limitations of the mantras 'make poverty history' and 'an end to poverty'. Winter in the Russian industrial city of Yaroslavl has been hard since the Global Financial Crisis. The 'contract' between Russia's elite and ordinary Russians, whereby the latter sacrifice their civil and political rights for economic wellbeing, is not delivering. After midnight, a group of international students, on a break from their night jobs as waiters, gather in a concrete stairwell and share their stories. Victorian premier John Brumby could learn a thing or two in that shabby stairwell. The lecturer's joke about religion is met with laughter. Here, 'faith' is the jester. In dismissing faith, we dismiss people for whom faith is central to the search for truth. We exclude them from that task of imagination and creation.